"I had a soup when I was on holidays this summer and loved it. So, when I got home and the weather changed a little, I decided to try to re-create it. What I came up with is the delicious, thick soup that is really more like a stew. It's amazing with dumplings dropped on top." Melt the butter in a large saucepan over medium-low heat. Whisk in the flour, and stir until the mixture becomes paste-like and light golden brown, about 5 minutes. Gradually whisk the beef stock into the flour mixture and bring to a simmer over medium heat. Cook and stir until the mixture is thick and smooth, 10 to 15 minutes. Stir in the bouillon cubes, vegetable juice, and Worcestershire sauce. Bring to a boil over medium-high heat, then add celery, carrots, onion, shredded cabbage, green beans, and tomatoes. Allow soup to return to a boil, then reduce heat to medium-low. Cover and simmer until vegetables are tender, about 30 minutes. Meanwhile, cook and stir ground beef in a skillet over medium-high heat until browned, about 10 minutes. Drain and set aside. 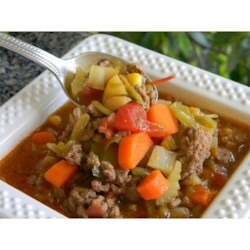 When the vegetables in the soup are tender, stir in the ground beef and simmer for 15 minutes. Stir in monosodium glutamate, pepper, browning sauce, and salt to serve.